First job of the day was to get my hair cut. It had been driving me mad for several weeks, but there had been nowhere to get it cut. Here in Suva we have walked past numerous salons, and so it was just a matter of choosing one to walk into. We hit lucky at the first one we tried – a hairdresser was free and it would cost me $7 for a trim. It was a very busy salon, so I guessed they knew what they were doing – although all the other customers had black African style hair... Too fed up with the mess on my head to worry about what it might end up like, I sat in the chair and watched the only white, straight hair in the room begin to hit the floor. As she snipped away, it started to look and feel a whole lot better, and I relaxed as the unruly mess became neat and tidy once more. Half an hour later I emerged from the salon a new woman, and only lighter in the pocket by $9 – I felt the hairdresser deserved a tip for her work. I think that may take the record for the cheapest haircut so far, at about £2. 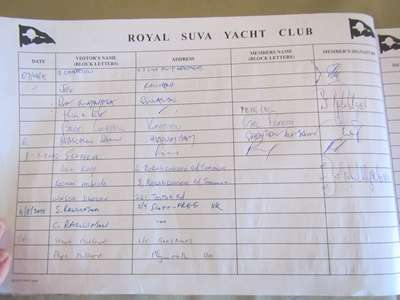 We then had a bit of shopping to do before heading to the Royal Suva Yacht Club for lunch. First stop was a fishing/dive equipment shop, where Steve was like a kid in Aladdin’s cave. He bought a variety of fishing equipment which will apparently increase our success at filling the freezer with ‘free’ food. Er, if we add up the cost of the equipment bought so far in this quest, I think we might be paying more per pound than at Tesco’s fish counter! Ah, but the more fish we catch, the sooner we recover our costs and then it will be free, says he. Hmm, think we might need to have a heck of a lot more success than at present before we reach that stage. But Steve enjoys the sport and it’s fun trying, so really anything we do catch is an added bonus. We left our purchases for later collection, and ambled off in search of a mobile phone shop where we might get our wifi router unlocked. It only works with a Vodafone Fiji SIM card and we want to be able to use it with whatever network is available in the next countries we visit. There was certainly no shortage of mobile phone shops, but each one pointed us towards another that could do as we requested. 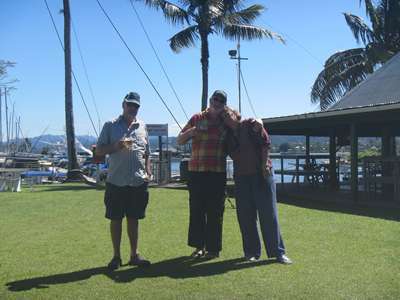 Eventually we gave up, but with the intention of continuing the search tomorrow, as it was time to head off to the Yacht Club to meet Bear and Pepe who had also been shopping. 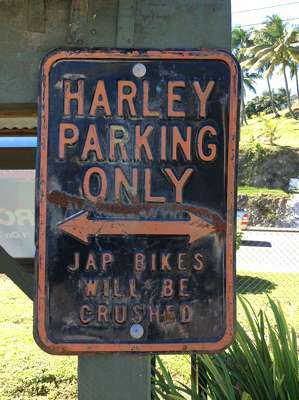 RSYC is obviously fussy about the motorbikes parked in its grounds! 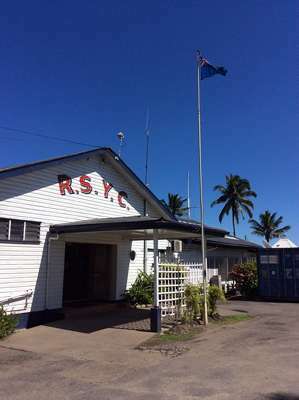 The Royal Suva Yacht Club. 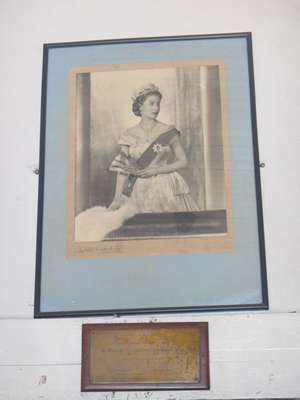 Her Majesty Queen Elizabeth II in the entrance hall. Just inside the club it seemed a little dated and tired, but as we walked through to the bar and garden, things improved and it turned out to be a very pleasant place to while away the time. 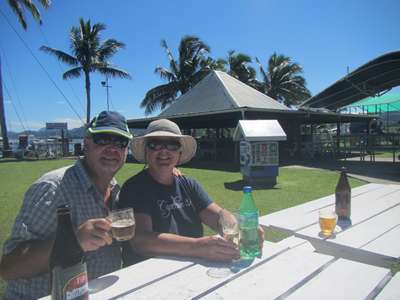 We found Bear and Pepe sitting in the sunshine enjoying a beer, so after signing ourselves in, we joined them, looking out over the lawn to the boats beyond. This is where we would have stayed if we had sailed here. We signed ourselves in as Visitors. A very pleasant place to sit in the sunshine. Thirsty work, walking. A well-kept lawn area overlooking the boats and bay beyond. 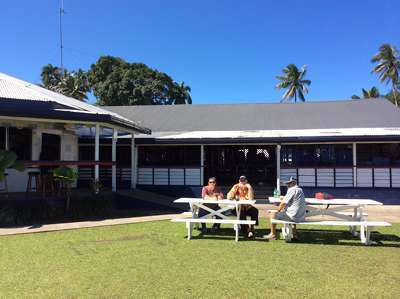 When the sun became too hot, we retired to the restaurant inside the club, where we took advantage of the lunchtime special of fish and chips, which was very good indeed, and very reasonably priced. Unable to face the walk back into town, we hailed a taxi which delivered us back at the shops where we collected Steve’s fishing stuff and popped into the supermarket to replenish beer stocks. 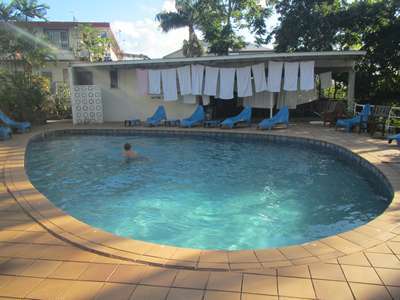 Back at the apartment we took advantage of the facilities and went for a dip in the pool to cool off after the day’s exertions. 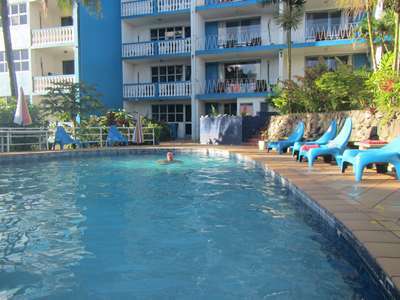 The pool was the nicest thing about the apartments, and excellent for cooling off at the end of a hot day.